PicturesOnGold.com creates the finest Photo Pendants and Charms, Gold Lockets, Silver Lockets and other Personalized Photo Jewelry in the industry. They create lasting photo lockets and photo jewelry keepsakes using only the finest 14k gold, white gold and Sterling Silver. Simply send them your photo and using their patented technology, they laser engrave your pictures in color right onto gold lockets, silver lockets, locket charms, as well as custom jewelry. The results are gorgeous gold lockets or silver photo lockets that open to reveal your photos and can be worn as a beautiful photo or picture locket. You will get the guaranteed highest quality with PicturesOnGold.com, they also offer a 1 year guarantee & all items arrive complete with a gift box, perfect for gift giving. So who are you shopping for this Valentine's Day? 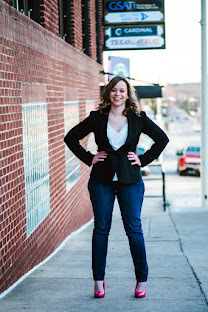 Let PicturesOnGold.com create that special & personalized gift for the one you love, you will have a hard time picking a favorite from their extensive jewelry selection! I was very excited when I found out I would be building my very own locket thanks to PicturesOnGold.com! After deciding on which locket I wanted, I selected the metal & size, then you have engraving options for the front. I chose a heart for the front & then added text on the inside left side which says, "My heart belongs to my children." For the inside right side of my locket I chose to have a black & white laser engraved picture of my children & I left the backside of my locket blank. I finished off my locket with an 18" Sterling Silver Rolo Chain. It only took me just a few minutes to build my own locket, I couldn't be more pleased with my order & how fast it shipped! So what do you think? Beautiful right? Do you have a loved one who would cherish a beautiful PicturesOnGold.com Locket? 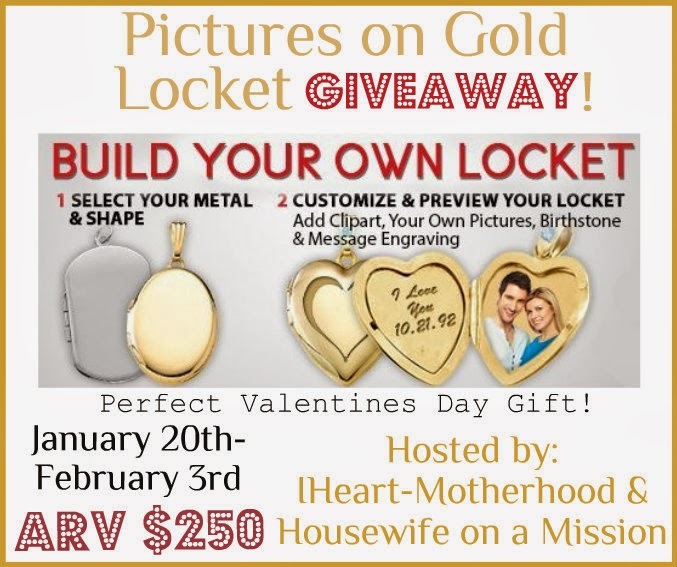 Buy it: Create your own PicturesOnGold.com Locket online & save 10% off your Valentine's Day Purchase with code valentine2014! Use the giveaway tools form, to enter! Good luck! I like the heart shape. I would get it for myself. I like the round shape I have a heart shape and I would keep it for myself. I love the white gold heart. I would get it for my sister with a picture of my nephew inside. I'd like to get the heart-shaped locket in silvertone for myself. I'd have my mom's photo in it - she passed a few years ago and I miss her terribly. I would love to have the heart shaped on because I would love to keep it for myself! I like the oval or round shapes, and I'd probably give this to my daughter for being my maid of honor later this year! I'd pick the heart shape to fit the photo of my love & myself in.for me to cherish of course! I would keep it for me!! Too cute to give away! I like the gold heart shaped locket. I like the heart shape and I would get it for myself. I would love the silver tone heart shaped locket for myself. I love the 14k White Gold Round Celtic Cross Locket for myself! I like the Build Your Own Gold 2-Picture Heart Locket. I'd put pictures of my boys in it. I would choose the heart shaped locket. It seems appropriate somehow. I love the heart shaped silvertone, and it would be for my mom. She never gets jewelry ! I would like to win this locket for myself. I would like to put a picture of our Family in it. I would go with the heart shape.